Description:- Sesame Street: Once Upon A Monster is an Adventure game for young players that combines the hallmark educational themes of the Sesame Street universe with the fun and ease of play of the Microsoft Kinect Sensor. 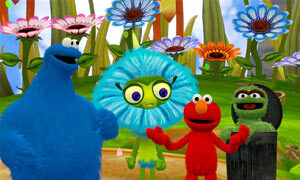 * An Xbox 360 exclusive, Sesame Street: Once Upon A Monster is an interactive storybook like no other as children join Elmo, Cookie Monster, Grover, Oscar the Grouch and other characters as they meet new monsters and help them overcome their problems. 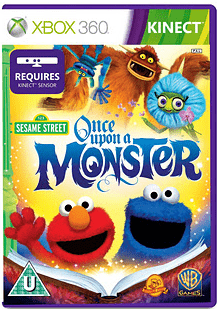 Game features include: multiple ‘chapters’ of play, familiar Sesame Street characters as well as friendly new monsters, drop-in/out 2-player co-op support and active gameplay featuring the controller-free Kinect Sensor. Review:- My oldest who is just coming up for five is a huge game fan, so is his daddy so he likes to copy him. He loves playing the DS and the Wii but he favourite is playing the Xbox 360 because that is daddy’s console. He was more than thrilled when we received a copy of Sesame Street’s Once Upon a Monster to review. This only works with the kinect so gets the players involved in the game and up and out of the seats. It is a very active game which is great for the little ones. You go along and discover about a long lost children’s book which happens to be called Once upon a Monster, you can read and join in the fun along the way, living the storybook adventure in Monsterland. Elmo and the beloved Cookie Monster are the main characters in the game. My little one who is 2 1/2 adored the characters and even joined in with most of the games but more often than not he would just sit mesmeriesed by the characters and pictures on screen. I ahve to say the graphics are amazing and I loved the game. A fairy story come to life where you can help out the characters with their problems and meet their friends following the story page by page. I loved Seseame street as a child so it was a trip down memory lane for me. One great thing about the game is that the children aren’t just playing they are learning, via the games, letters, numbers, etc but also emotional learning, with making friends, taking turns, etc. All done cleverly through the game. It is easy to play and both my little ones picked it up quickly. My youngest loves animals, escpecially monkeys so one of his favourite games was Monkey-see, Monkey do. He laughed his little head off playing this. The oldest loved the obstacle courses and become very good at it. There is also dressing up and watering the plants games. Not forgetting some very funny and energetic dance routines. There is so much to see and do in this game, no chance of the children getting bored with it. I would highly recommend this game, if you have little ones pre-school and early school age they will love this game. Even if they are not aware of Sesame Street, you can’t help but love the characters. I even loved playing the games, there really is something there for everyone. The graphics are also stunning. A perfect Christmas present. Disclaimer:- I was sent this game in exchange for an honest review.